An initial schedule for Orientation 1998 decided upon by a committee of deans and faculty was released this week, drawing mixed reactions from students and faculty. While the process of modifying what was once called Residence and Orientation Week is still ongoing, some changes to next year's rush at this point are certain to take place. Major changes to Orientation 1998 include the elimination of Killian Kick-off, Thursday Night Dinners, and project Move Off Your Assumptions. Fraternities, sororities and independent living groups will also be banned from obtaining lists of freshman addresses for summer mailings. A Residence Midway in Johnson Athletics center, in which each dormitory and FSILG will be represented, will replace Killian Kick-off. Project MOYA will be replaced with "Johnson Games," said Coordinator of Student Programs Elizabeth I. Cogliano. Dormitory rush events will also be held in the same time frame as FSILG rush events. There will be no delay between when rush begins and when dormitories can hold events, which was the case in past years, Cogliano said. The beginning of orientation week has also changed. Students will arrive one day earlier to participate in an all class dinner Wednesday night with faculty and some upperclassmen, Cogliano said. The idea is "to have a kickoff event at MITbe unifying of the entire community," said Associate Professor of Political Science Charles Stewart III, who was on the committee that helped to outline the new schedule.Freshmen will then "ease into"the residence selection process, he said. The focus of Orientation 1998 will stress the academic for the first two and a half days, then the focus will shift to residence selection for the next two and a half days, Hodges said. Following residence selection the focus will switch back to academic orientation. The idea is to create a "clear separation between housing issues and academics," Hodges said. Rush will begin Friday evening with the Residence Midway, which initially was proposed by the Interfraternity Council. Panhellenic rush, which will go largely unaffected, will also begin Friday evening. According to the tentative schedule, residence selection will begin in earnest after the Freshman Essay Evaluation, tentatively scheduled for Saturday morning. However, it is hoped that the Freshman Essay Evaluation will move online so that incoming students may take it over the summer, Hodges said. Residence selection will extend through Monday. Academic orientation and meetings with freshman advisors will begin on Tuesday. However, this schedule is also tentative and may change, Hodges said. Tuesday morning may be made free to continue with residence selection that morning, said Duane H. Dreger '99, IFCpresident. Entries in the Daily Confusion will be more regulated. While groups will still be able to list their events, they may potentially be limited in the number of events they can list, Cogliano said. The proposed changes to rush are viewed as an "experimental program"that will be used to consider future changes, said Dean of Students and Undergraduate Education Rosalind H. Williams. Rush chairs are divided on whether the new ban on summer mailings will hurt or help their recruitment activities. Under the proposal, ILGs will not receive the list of incoming students before rush. While "many FSILGs feel it is critical for them to target incoming freshmen before they come in," the issue of summer mailings to freshmen is "non-negotiable," Hodges said. "I want to let [incoming freshmen] decide first," Hodges said. Instead of being able to send out rush booklets, dormitories and FSILGs will each have an entry in an expanded residence selection booklet which will list certain objective criteria yet to be decided upon, Hodges said. In the book will be a reply card which freshmen have the option of returning to receive more information about a particular dormitory or FSILG. The exact details of the of the reply card have yet to be finalized, Hodges said, although it may be a simple checkbox system for each residence plus blanket checkoff boxes. Some object to the idea of a reply card. "Almost everyone I live with, including myself, would have never filled out that card," said Jay P. Muchnij G, former rush chair for Epsilon Theta. The changes "effectively eliminates summer rush," said Sigma Phi Epsilon rush chair, Felix Dashevskiy '99. Others aren't worried. "I don't feel too bad about not getting the list," said Nathan J. Williams '98, pika rush chair. Another point of disappointment among rush chairs is the overall perception that there is less time to interact with freshmen and less opportunity for freshman to make a choice about where to live. The "lack of time to do things is really the biggest problem," Nathan Williams said. "Reducing the time of rush is only making the choices less informed," Dashevskiy said. 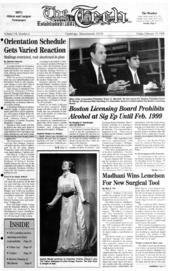 Another point of contention among students was the lack of student input into the initial decisions about what would changes would take place during Orientation 1998. The changes to freshman orientation were decided upon by a committee composed of concerned faculty deans, and administrators, Hodges said. Although one student sat in on a committee meeting to offer input, no student officially served on the committee. Students were left off the committee as part of a conscious effort to have faculty and deans ponder what they want students to get out of orientation, Hodges said. Not to have students on the original scheduling committee, was "inappropriate," Muchnij said. "I am more concerned with the decision making process." While rush chairs have yet to become accustomed to the changes that have been thrust upon them in the past week, administrators responsible for the changes insist that they are grounded in what was determined from discussions in the fall. There were many guiding principles to the changes made, Hodges said. One message the Institute wants to send to students is that "the reason they're at MIT is to get an education," he said. Another impetus for changing rush was the realization that parents might influence their sons and daughters into not rushing as a knee-jerk reaction to being bombarded with summer mailings, Hodges said. "There have been concerns raised by entering students, in addition to faculty and staff and some student groups, that there is such an onslaught of information thrust at students during the summer that it's overwhelming, that it's assaultive, and that there has developed an arms race among different student groups, particularly residential, and that sends the wrong message to students," Stewart said. "We need to realize that if we did nothing to R/O, chances are it would have a negative impact on rush," Hodges said. Many things, however, still have to be decided upon such as the IFCrules governing the extension of bids, Dreger said. The IFC Rush rules committee will meet in two weeks to continue working on changes, Dreger said. Rush chairs will also have to plan how they will structure events given the new changes. "They basically have to change their way of thinking to deal with the new rush," Dreger said. "A lot of houses are going with a gloom and doom attitude. They better get their acts to gather before rush starts or they will be doomed," Nathan Williams said. Douglas E. Heimburger contributed to the reporting of this story.